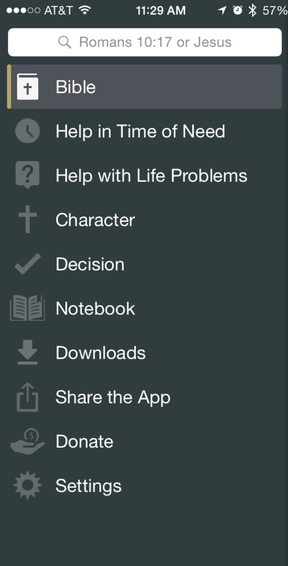 The Gideon Bible App menu screen. Since its launch in late 2015, the free Gideon Bible app has been downloaded by over 35,000 people throughout the world, and it’s receiving positive reviews for its many useful features. By selecting the app’s dramatized audio feature, one can experience God’s Word in a whole new way. Dramatic reading, sound effects, and music scores combine to bring this audio version of Scripture to life. The search feature can quickly retrieve passages by book, chapter, and verse, or by keywords or phrases. Verses can be highlighted or bookmarked. Like all our Scriptures, the Gideon Bible App is meant to be shared freely with others, especially when used as a personal witnessing tool. With just a tap, a user can share the app via Facebook, Twitter, SMS, Email, or AirDrop. The sharing feature also makes the app an easy alternative for putting a Scripture into the hands of someone who speaks a different language. Users can choose from a variety of Scripture language options including: Arabic, Chinese, English, French, Spanish, Portuguese, Russian, Vietnamese, Farsi/Persian, Dutch, Hebrew, Indonesian, Italian, Korean, Thai, Turkish, Urdu, Vietnamese, and many more. The Decisions page features the plan of salvation, allowing the user to quickly and easily help someone understand why we all need Jesus as our Lord and personal Savior. To see a video of the app in action, click here. Or download the app now, free, from your mobile device. My new Barber was from Albania and when he finished my hair I told him about the Bible App and he immediately down loaded it and selected Albanian, saying now I can read Bible in my own language . 3 people have done this so far in their own tongue , only 1182 people left to cover current list of Languages. Schools RE Lesson pupils also very interested.